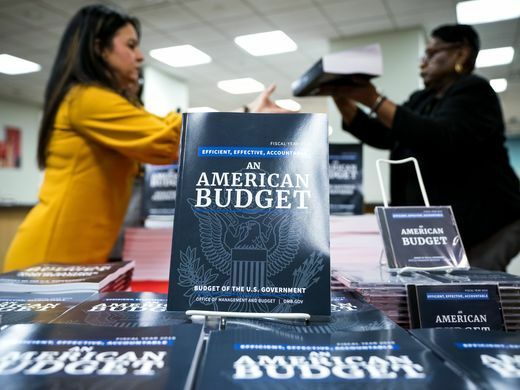 Donald Trump sends Congress a $4.4 trillion budget proposal, in a plan that adds $7 trillon to the Government deficit over 10 years while sharply cutting domestic programs. The proposal is more of a statement of intent than a defined budget, with little chance of adoption in Congress. However, it is illustrative of Trump’s abandonment of the long-time GOP declaration of a balanced budget, while committing to large increases in military spending and slashing other agencies and programs such as Medicare, food stamps, and nutrition initiatives. The White House budget request would add $984 billion to the federal deficit next year despite the cuts. Any hope of a balanced budget had been put aside in December when the GOP pushed a $1.5 trillion tax cut through Congress. Last week, with the Trump Administration’s proposals still awaited after more than a year, legislators agreed on an extra $326 billion for the military and domestic programs — such as disaster relief, infrastructure, and child care — through 2019. The Administration’s proposals maintained the increase for the military but to claw back the assurances for the domestic programs, cutting the Congressional authorization by $65 billion and making $28 billion discretionary rather than mandatory. Mick Mulvaney, the director of the Office of Management and Budget, wrote Speaker Paul Ryan that the Administration “does not believe these non-defense spending levels comport with its vision for the proper role and size of the federal government”. The budget proposal sets out at least $1.8 trillion in cuts to federal entitlement programs such as Medicaid, Medicare, and food stamps. It cuts funding for the Supplemental Nutrition Assistance Program by more than 30%. The largest share of the cuts — about $1.5 trillion of a total of $3 trillion — would come from a “two penny plan,” slashing non-defense discretionary spending by 2% a year every year. That reduction would compound to about 40% cut in the next decade. Beside the military, the other big “winner” in the proposals is the Department of Homeland Security, with an increase of about 8% to $46 billion. That increase is devoted to the Trump Administration’s crackdown on immigrants and the Wall on the border with Mexico. The request calls for $18 billion for border security, including $1.6 billion to build about 65 miles of the wall in southern Texas and the hiring of 2,000 new Immigration and Customs Enforcement and 750 Border Patrol agents. The proposal also plans for $200 billion for infrastructure, hoping to attract another $1 trillion in spending from states and private enterprise. The American Society of Civil Engineers says $2 trillion is needed to repair US infrastructure, warning that failure to do so will cost the US economy $4 trillion by 2025. Democrats in the House of Representative have proposed an injection of $1 trillion in direct federal spending.